The pip-squeak of peripherals has come a long way since 1964 when the first mouse – made of wood – crawled across our desktops and into our hearts. From those humble beginnings, mice have bred like, well, mice! Here are 20 of the most noteworthy, from extra cheesy to the cat’s meow. 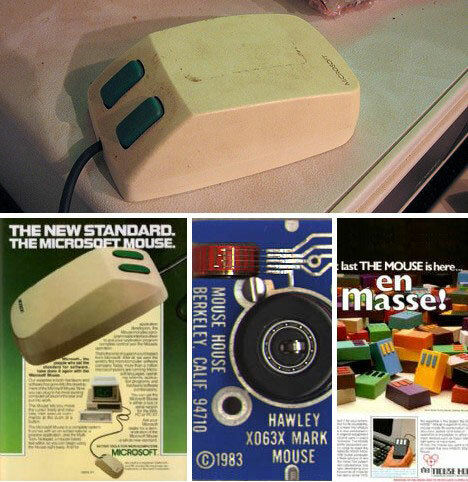 Though it may look somewhat primitive – who am I kidding here, it’s positively Soviet – the first computer mouse was custom crafted for a purpose and did its job so well, it became the model for generations of mice to follow. 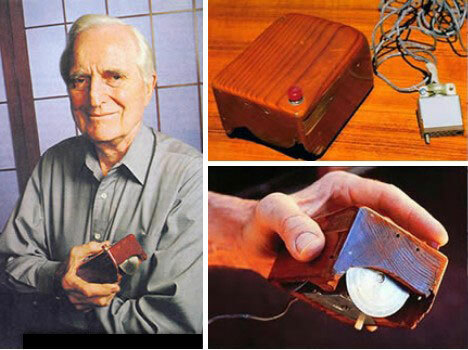 Credit Douglas Engelbart for contriving this contraption from a block of wood, a couple of gear wheels and a shiny, candy-like red light/button that just begs to be pushed. By December of 1968, Englebart had cobbled up a three-button mouse suitable for demonstration before a bemused audience at the Fall Joint Computer Conference in San Francisco. Englebart’s mouse was no one-trick pony, though it would be some time before the computer mouse made its way to home computers. The Xerox 8010 Information System debuted in 1981 and was one of the first commercial all-in-one computing systems to hit the market. Significantly, it included a mouse! Not that many 8010’s were sold, but then again, not that many home computer users had $16,595 to splurge back then. Apple’s wonder Stevies, Jobs & Woz, had a knack for noting other folks’ good ideas and making them better. The mouse was a case in point. 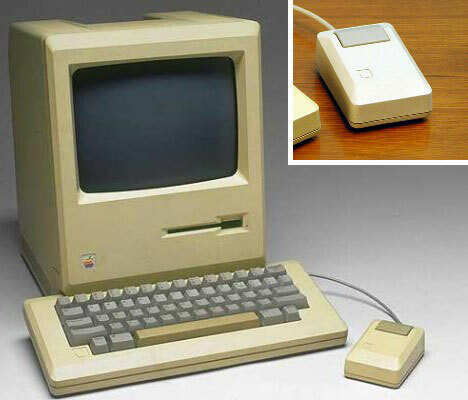 The Apple Lisa of 1983 came with a mouse but was rather pricey ($9,995) for home users; that all changed with the introduction of the Macintosh the very next year. 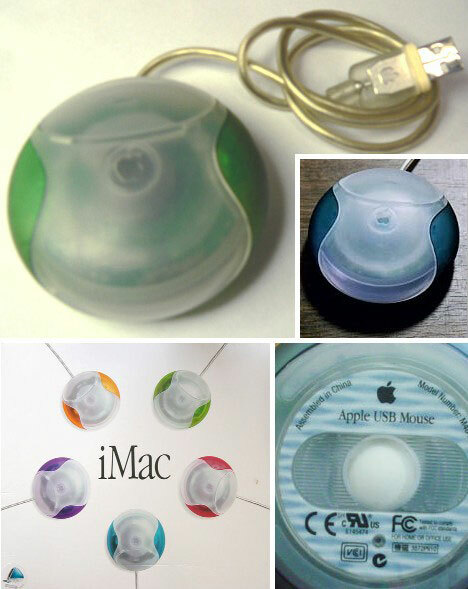 Apple would stick with squarish, boxy styling for some time… too long, some say, before overshooting the mark in 1998 with the Apple USB Mouse, product number M4848. Designed more to match the sensuous curves of the groundbreaking iMac then to address any ergonomic concerns, the so-called “hockey puck” may not have cramped anyone’s style – but their hands were another matter. 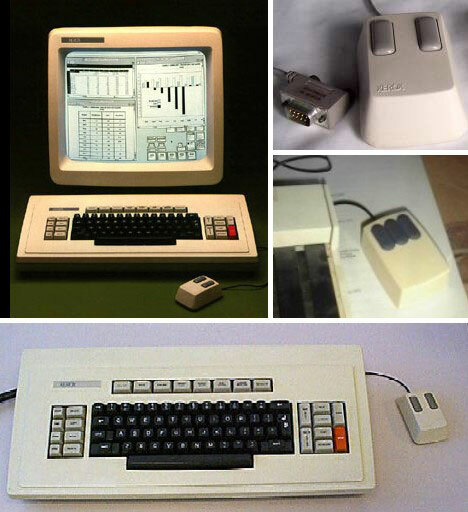 Microsoft one-upped the Apple Lisa by bringing the version of the IBM PC mouse to market in 1983. It featured two buttons – that’s the “one-upped” part – and retailed for $195 each. The price sounds shocking today but compared to the $400 three-button Hawley X063X from the Mouse House it seemed quite reasonable. By the late 1980s, Logitech had emerged as the leading “alternative” peripherals provider. After first releasing a 3-button mouse in 1982, Logitech introduced the MouseMan Left, MouseMan Right and MouseMan Large in 1990. 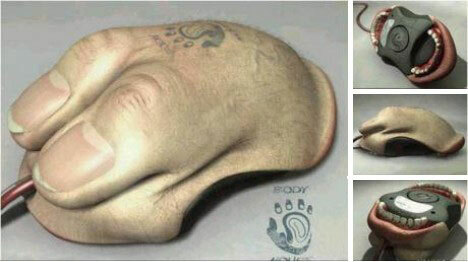 It then released the first wireless mouse, Logitech’s Cordless MouseMan, the very next year. As the first mouse without a tail, so to speak, the Cordless MouseMan used RF (radio frequency) technology which didn’t require line-of-sight alignment and was powered by a quartet of Ni-Cad batteries. 1995 brought us ProAgio, the first mouse with a built-in scroll wheel… or rather, Mouse Systems did. The Fremont, CA based company was ahead of its time but behind the 8-ball when it came to advertising. Here’s what Mouse Systems had to say about their great leap forward: “Surfing the Net has never been easier – with ProAgio ($49.99), the incredible five-button PC mouse. ProAgio is the latest wave in Web technology, with a scrolling roller that lets you zoom through Web pages without ever touching the scrollbar. So, why crawl when you can cruise the Web with ProAgio’s unparalleled speed, performance, and flexibility?” Why indeed. Mouse Systems made a good case for the scroll wheel but it wasn’t until Microsoft jumped on the bandwagon that things really began to scroll. 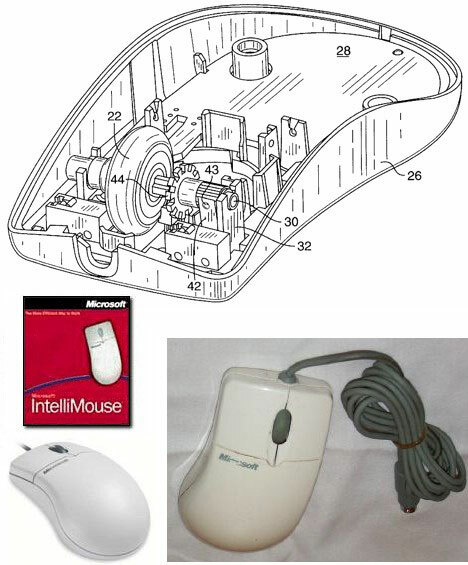 In 1996, the first Microsoft Intellimouse was released featuring a third mouse button under the wheel. Curiously, an MS engineer named Eric Michelman claims to have originated the idea for the mouse scroll wheel in 1993, though it took some time to get Microsoft, a many-layered behemoth even then, behind the idea. Even odder, Microsoft didn’t file for a patent on the mouse wheel concept until 1999. 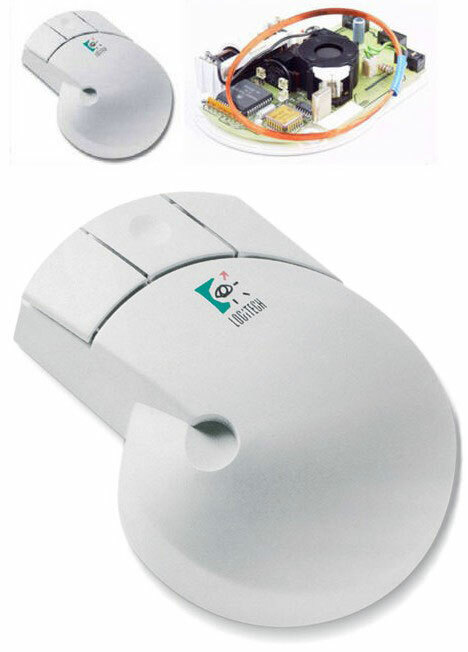 1999 was a pivotal year for mouse tech as a number of major manufacturers brought out versions of the optical mouse. 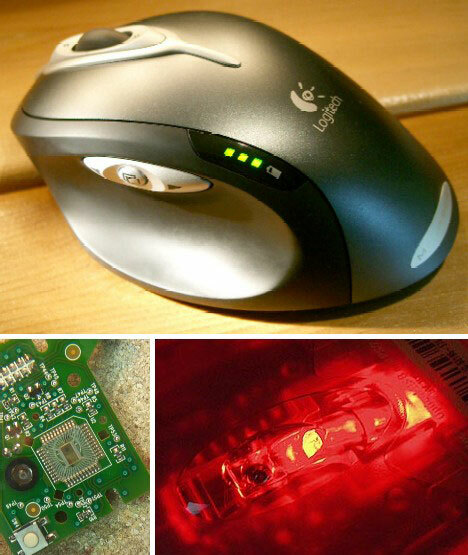 Originally infrared LED based, optical mice would eventually go to laser tracking, with Logitech’s MX-1000 (above) leading the way. By the dawn of the new millenium, one could happily click away on a wireless, optical mouse that needed neither cleaning nor a dedicated mouse pad. What’s next for the computer mouse? They seem to be at the peak of development so the next step may be fragmentation into a range of market niches. Tiny mice, gaming mice, mice that warm your hand, even a Heartbeat Indicator Mouse – these specialty mice are available now and more specialized versions are certainly in development. 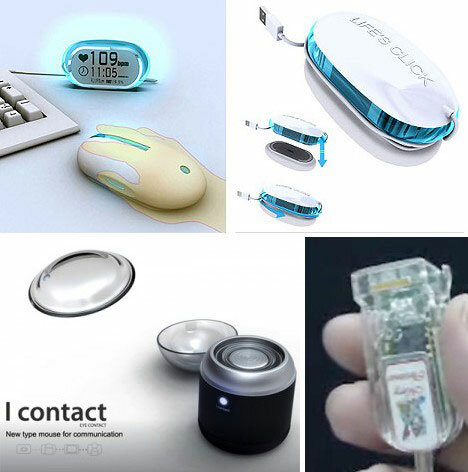 Others are in the concept stage, such as the I-Contact, a contact lens mouse. Eye caramba! 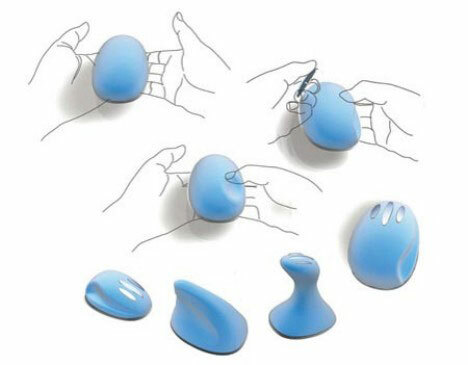 Actually it’s called the Jelly Click mouse; I’m sure Mickey has no trouble getting a date. We’ve now moved beyond futuristic to just plain weird, and the Jelly Click mouse is weirdness squared. To be fair, this mouse concept by designers Bongkun Shin, Heungkyo Seo, Jiwoong Hwang and Wooteik Lim could have some practical applications… such as, it’s safe for use poolside or its shape conforms to any hand. Want a soft & squeezable mouse but need even MORE flexibility? The Moldable Mouse design concept by Lite-On answers the question only one of the Fantastic Four would ask. Bend it, shape it, anyway you want it, the Moldable Mouse is made to be pushed around. As for the buttons, they’re RF stick-ons that you can put anywhere you want, sort of like Mr. Potato Head. Ditto for the touch-sensitive scroll pad. It’s so much fun you’ll never have time to do any work! Curser and cursor in one! The Skype Mouse VOIP Phone manages to combines two very different functions – that of a Skype phone and a 2-button, scroll wheel computer mouse – and perform both very well while managing to look simply smashing! 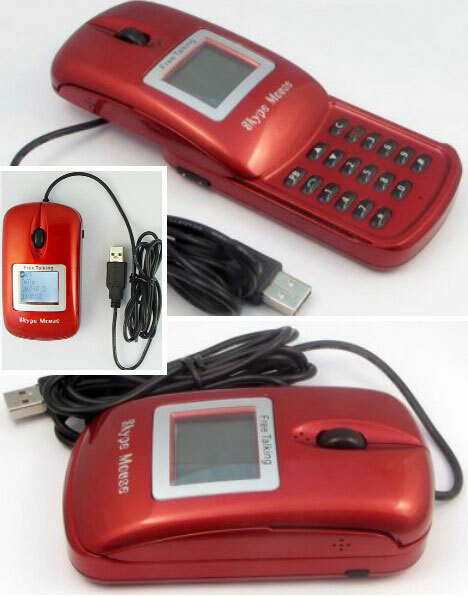 The sliding cover reveals a standard phone keypad and incorporates a generously sized backlit LCD screen. Repetitive, soul-killing job got you feeling like a zombie? Got an uncontrollable urge to off the prime minister of Malaysia? Then the Brain Mouse is just what you need! 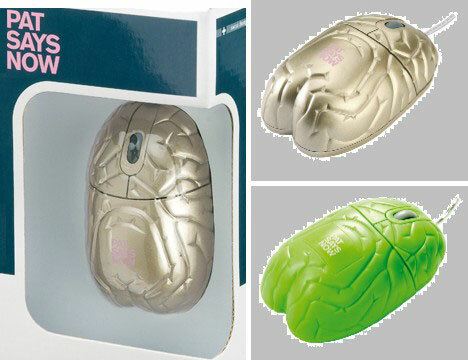 According to the manufacturer, Pat Says Now, “The Brain Mouse has been used to advertise the Paramount movie Zoolander”. It comes in Metallic Gold or Bilious Green… but unfortunately not Blue Steel. 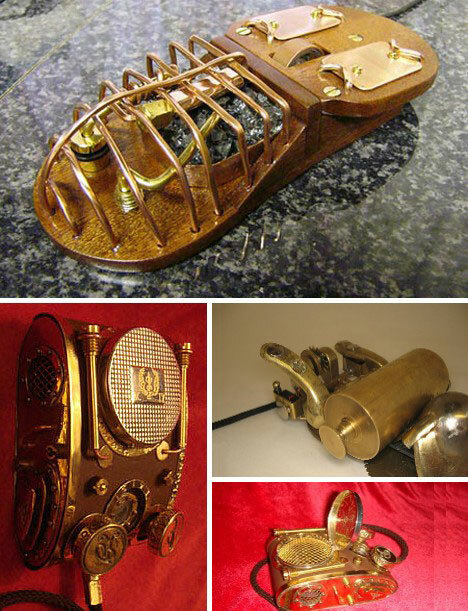 Steampunk style has come to computers in a big way, and the computer mouse is not immune from those who work with wood, copper and brass. A prime example is the Steampunk Furnace Mouse (above, top), a labor of love whose creator is happy to share each step in its construction. Second cousin to the Steampunk Mouse is the Stone Mouse, a pet (rock) project by a Russian designer named Neko who figured the best way to move forward was to go back – WAY back. Though the cracked and polished surface of the mouse is undeniably attractive, the cheesy beige plastic scroll wheel and cord tend to detract. 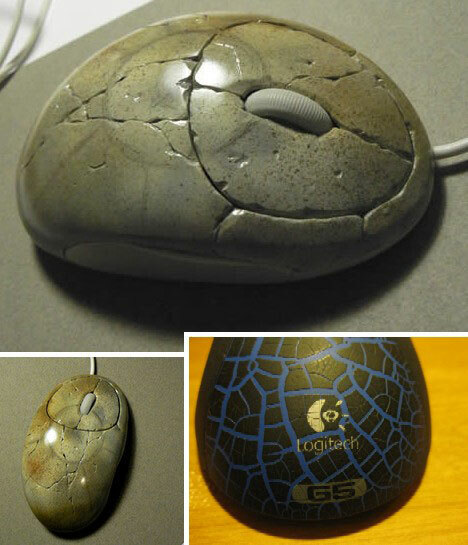 Logitech goes for the stone look, or at least that of cracked asphalt with its G5 laser gaming mouse. Rock on, dudes! Just got your AIG bonus and not gonna give it back? Step on over to Pat Says Now (yes, the Brain Mouse people) for what may be the world’s most expensive mouse: about £12,400.00 / $24,180.00 USD. 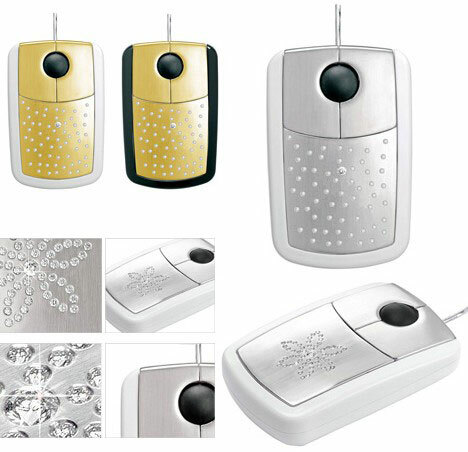 The 3-button, scroll wheel optical mouse comes with a 3-year warranty in case any of the 59 brilliant cut diamonds falls off. Choose from yellow, red or white 18K gold with white or black trim. Now this is one fugly mouse… it must be, since it’s posted at fugly.com. Not much is known about the workings of the device and seriously, I wouldn’t want to get too near it either. It appears to sprout bristly hairs on the back of the “hand” along with simulated veins, dirty fingernails and a faded Body House tattoo. For some odd reason, there are two rows of teeth underneath, making it the world’s first computer mouth. This creepy mouse accessory is a Mini-skirt Mouse Warmer but I smell a rat. Let’s not let first impressions detract from this product’s functional features, however. 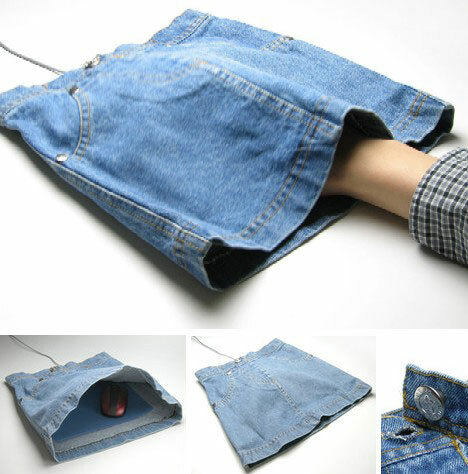 The so-called Direct Donya DN-Miyuki can conceivably keep one’s hand warm, plus the denim surface can indeed approximate the surface of a mouse pad. Yeah, that’s the ticket – and your boss and co-workers will understand completely. Last and not least, who wouldn’t love a mouse that’s a mouse? OK, lots of folks but still. 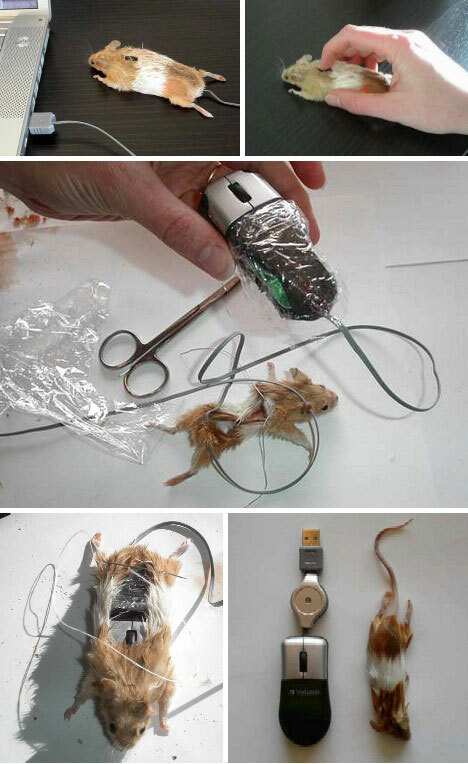 It had to happen, and leave it to the twisted minds at Instructables to not only make the mouse mouse a reality, but show exactly how it’s done using too-clear language such as “run the cable through the tail hole”. No mention if the eyeballs act as buttons, though it would be teh cool if they did. 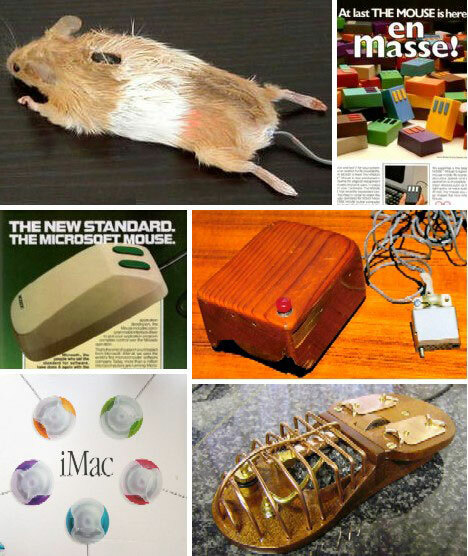 Instructables also recommends using a taxidermied (stuffed) mouse, but it’s only a suggestion. Your cat will love you (and your GF/wife will hate you) either way.